We've decided to continue our short series on "Police Brutality" and other police malfeasance for the moment with some excerpts from Wikipedia's entry on Police Brutality, and it will provide the background for future articles that point to one of the biggest problems for the poor, disadvantaged, disabled, and non-white members of our society, the brutalization of innocents - and even of those not-quite-so innocent. As this site is aimed primarily at U.S. readers, please check out the links in the Wikipedia article for entries of police brutality in your country. Some time back I was informed by a defense attorney during a trial that the police officer on the stand was lying through his teeth; that the prosecutor knew he was lying; and that the judge knew he was lying - but the feeling was that even if the defendant was innocent of the charges against him (drug-related), by his "gangsta" looks he had to be guilty of something. 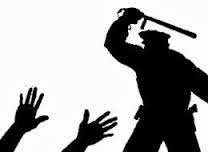 "Police brutality is the wanton use of excessive force, usually physical, but potentially in the form of verbal attacks and psychological intimidation, by a police officer. 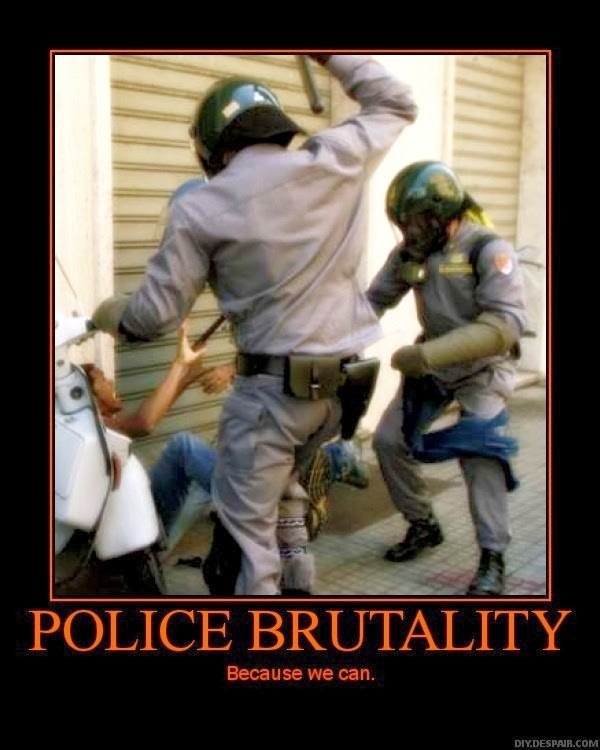 "Widespread police brutality exists in many countries, even those that prosecute it. 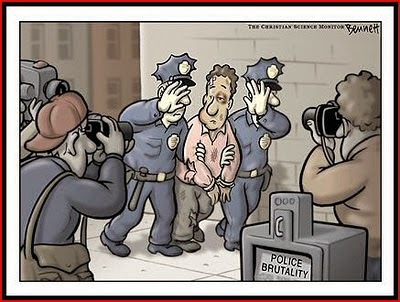 It is one of several forms of police misconduct, which include: false arrest; intimidation; racial profiling; political repression; surveillance abuse; sexual abuse; and police corruption. However, as aforementioned, it may involve physical force but never reaching death under police custody. "The word 'brutality' has several meanings; the sense used here (savage cruelty) was first used in 1633. The first known use of the term 'police brutality' was in the New York Times in 1893, describing a police officer's beating of a civilian. "The origin of modern policing based on the authority of the nation state is commonly traced back to developments in seventeenth and eighteenth century France, with modern police departments being established in most nations by the nineteenth and early twentieth centuries. Cases of police brutality appear to have been frequent then, with 'the routine bludgeoning of citizens by patrolmen armed with nightsticks or blackjacks.' Large-scale incidents of brutality were associated with labor strikes, such as the Great Railroad Strike of 1877, the Pullman Strike of 1894, the Lawrence textile strike of 1912, the Ludlow massacre of 1914, the Steel strike of 1919, and the Hanapepe massacre of 1924. "Portions of the population may perceive the police to be oppressors. In addition, there is a perception that victims of police brutality often belong to relatively powerless groups, such as minorities, the disabled, the young, and the poor. 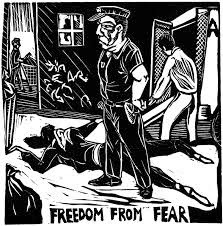 "When used in print or as the battle cry in a black power rally, police brutality can by implication cover a number of practices, from calling a citizen by his or her first name to a death by a policeman's bullet. What the average citizen thinks of when he hears the term, however, is something midway between these two occurrences, something more akin to what the police profession knows as "alley court"—the wanton vicious beating of a person in custody, usually while handcuffed, and usually taking place somewhere between the scene of the arrest and the station house. 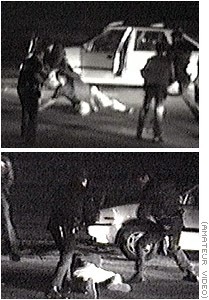 "In 1991, Los Angeles police harshly beat African American Rodney King. The police officers involved were acquitted and is widely believed to have lead up to the Los Angeles riots of 1992, causing 53 deaths, 2,383 injuries, more than 7,000 fires, damage to 3,100 businesses, and nearly $1 billion in financial losses. After facing federal trial, the officers received 32 months prison sentence. The case was widely seen as a key factor in the reform of the Los Angeles police department. 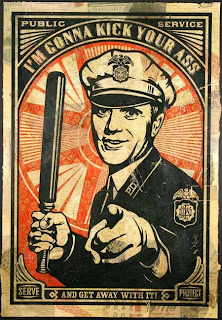 "Police officers are legally permitted to use force, and their superiors — and the public — expect them to do so. According to Jerome Herbert Skolnick, in dealing largely with disorderly elements of the society, some people working in law enforcement may gradually develop an attitude or sense of authority over society, particularly under traditional reaction-based policing models; in some cases the police believe that they are above the law. "Deficiencies in internal accountability mechanisms (including internal investigation processes). "Police use of force is kept in check in many jurisdictions by the issuance of a use of force continuum. A use of force continuum sets levels of force considered appropriate in direct response to a subject's behavior. This power is granted by the civil government, with limits set out in statutory law as well as common law. 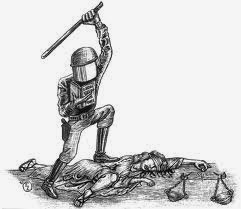 "Violence used by police can be excessive despite being lawful, especially in the context of political repression. Indeed 'police brutality' is often used to refer to violence used by the police to achieve politically desirable ends and, therefore, when none should be used at all according to widely held values and cultural norms in the society (rather than to refer to excessive violence used where at least some may be considered justifiable). "Numerous doctrines, such as federalism, separation of powers, causation, deference, discretion, and burden of proof have been cited as partial explanations for the judiciaries' fragmented pursuit of police misconduct. However, there is also evidence that courts cannot or choose not to see systemic patterns in police brutality. Other factors that have been cited as encouraging police brutality include institutionalized systems of police training, management, and culture; a criminal-justice system that discourages prosecutors from pursuing police misconduct vigorously; a political system that responds more readily to police than to the residents of inner-city and minority communities; and a racist political culture that fears crime and values tough policing more than it values due process for all its citizens. It is believed that without substantial social change, the control of police deviance is improbable at best. "In the United States, the passage of the Volstead Act (popularly known as the National Prohibition Act) in 1919 had a long-term negative impact on policing practices. By the mid-1920s, crime was growing dramatically in response to the demand for illegal alcohol. Many law enforcement agencies stepped up the use of unlawful practices. By the time of the Hoover administration (1929–1932), the issue had risen to national concern and a National Committee on Law Observation and Enforcement (popularly known as the Wickersham Commission) was formed to look into the situation. The resulting "Report on Lawlessness in Law Enforcement" (1931) concluded that '[t]he third degree—that is, the use of physical brutality, or other forms of cruelty, to obtain involuntary confessions or admissions—is widespread'. In the years following the report, landmark legal judgements such as Brown v. Mississippi helped cement a legal obligation to respect the due process clause of the Fourteenth Amendment. 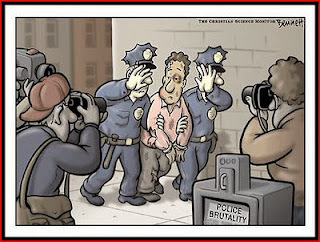 "Police brutality can be associated with racial profiling. Differences in race, religion, politics, or socioeconomic status sometimes exist between police and the citizenry. Some police officers may view the population (or a particular subset thereof) as generally deserving punishment. Portions of the population may perceive the police to be oppressors. In addition, there is a perception that victims of police brutality often belong to relatively powerless groups, such as minorities, the young, and the poor." 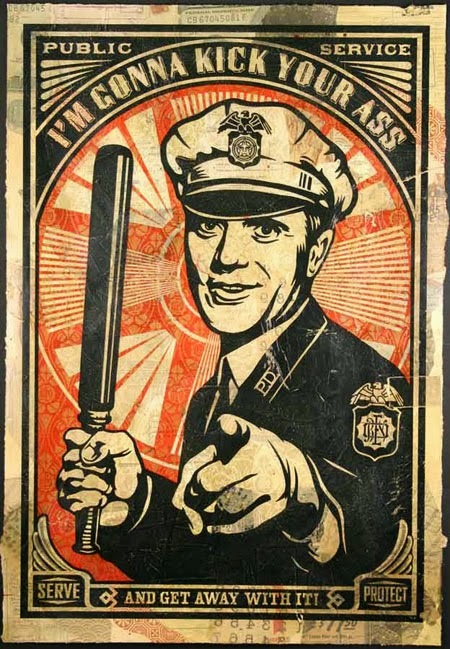 The "police culture" here has led to systemic failures over and over again, and only Congress can set up a framework to control the rogue cops, and this will NOT happen with a Conservative majority in Congress and the Supreme Court, as police brutality is favored by those with an Authoritarian bent - the American Conservative...the irony being that the criminal is wildly in favor of the police brutalizing anyone else - except for him. Eliminate Conservatism, and we eliminate police brutality and malfeasance, QED. Next: More On Police Brutality.